14 months of Data Sheets! The KTBS are sure that if STTF/Sawyer had read the overwhelming evidence and tested this hypothesis in the field they would have quickly realised that it needed re-examining. 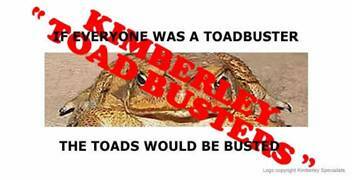 (Sawyer and STTF assert publicly against AGWA, DEC and the KTBs hypothesis that the KTB hypothesis is wrong because of the number of toads that they have found at Auvergne Station. Had STTF consulted with DEC or the KTBs (before leaving Perth for their muster) about the cane toad incursions on Auvergne they would not have been surprised on arrival from out of town. Many of the cane toads on Auvergne are now congregating around drying water holes where they will die before the wet season arrives. Those water bodies such as the Auvergne Flying Fox lagoon need busting urgently before the wet season).